Welcome to Farmstead Catering — your only destination for direct, farm-to-table catering in and around the Adirondacks as well as upstate New York. At Farmstead Catering, we operate as a synergy between farm and kitchen by “insourcing” all the ingredients to make your wedding meal fresh and flavorful. Our company is comprised of farmers, artisans and chefs who transform ingredients grown at our 170 acre farm into seasonal menus that are raised with you in mind—from seed to plate. Our business model is based on trust between you, the clients, and us, the farmers. From our fields to your tables, we promise to provide you with truly exceptional food and an honest and pleasurable business experience. "Farm to table isn't just a catch phrase around here. Our farm is fully integrated with our culinary vision in order to deliver elegant seasonal dishes made with 100% organic ingredients fresh from our very own farm. If full-flavored, local food is important to you, look no further." Our food is not economy food, it's once in a lifetime food. Each menu is an honest reflection of the season, full of flavor, texture, and personality. We provide you with nearly every ingredient from our 170 acres of diversified fields and forests. From the golden cultured butter and freshly-harvested salad greens to perfectly ripe vegetables and pasture-raised meats, our food is the truest expression of farm-to-table dining. Instead of "striving" to use local ingredients or "featuring" them, we simply do. In fact, it's all we do. We love working with our clients! They embrace the spirit and values of our farm and business, and we provide them with customized, detail-oriented service options. Equipped with years of experience, the Farmstead team has earned a reputation for smoothly-run, stress-free events. From rustic farmhouse family style menus, to on location wood-fired pizzas and Argentinian Asado dinners - we design and execute food service that is tailored to our clients. Our staff have a hand in every aspect of our seed-to-table menus and provide a food experience and connection unmatched by traditional caterers. With detail-oriented planning and local knowledge, we provide consultation and coordination in everything from finding a venue to establishing a timeline. Our on the ground support allows your vision to become a reality from near or far with the help of a talented event coordinator on staff. Beautiful food deserves a reception that is flawless from beginning to end. Farmstead Catering boasts an inventory of one-of-a-kind rental items like hand-crafted wooden bowls made in the Adirondacks as well as tasteful glassware and vintage items for a rustic and unique presentation. From place settings to tents, we help advise and handle the the items you need for a beautiful and well-orchestrated event from our own collection and that of our trusted rentals vendors. We harvest a vibrant blend of wild and cultivated flowers grown to your specification. Additional greenery can accentuate the natural beauty of your event like arching branches, fruit blossoms, and winding grapevines or hops. Our flower service extends from cut flowers by the bucket to table bouquets and fully decorated custom built arches that provide the perfect backdrop for an outdoor ceremony. Our professional bartenders provide elegant and authentic service with options ranging from a beautifully maintained self-service bar to a full open bar. We source your beverages from local breweries and vineyards, and we create farm-crafted cocktails made from fruits, flowers, syrups, herbs, and garnishes grown in and around our gardens. Our team and business ethic is community-based and centered on building beautiful, collaborative experiences for our clients. We staff our events with the strapping young farmers, brainy entrepreneurs, and tactile artisans that have had a hand in making the Farmstead Catering story whole and continuous. Dillon has been working toward delivering an authentic farm to table catering experience for over a decade. His interest in connecting people, place, land, nature and culture was born out of his upbringing in upstate New York. He leads the collaboration with an acute attention to detail, always seeking the ultimate local food experience for his clients. As the owner of the company, Klepetar is responsible for marketing, contracts, logistics, permitting and client relations. His innate ability for executing events that exceed expectations has given Farmstead Catering a reputation as one of the premier event caterers across northern New York. When not behind a desk or in beast mode at the farm, Dillon can be found fly fishing, rollerskating or tinkering with old diesel engines. Taylor has a degree in Horticulture, years of farming and restaurant kitchen experience from around the world, and an obsession with food culture. The seasons and soils of the Northeast taught him how to grow, forage, and preserve food that gratefully finds its way to a dining table. His cooking brings creativity and finesse to our menus in a way that aims to highlight our unique terroir. As the head chef, Taylor enjoys creating menus that marry our clients' personalities with the remarkable ingredients raised here at Echo Farm. As a farmer, he focuses on further establishing healthy and nutritious soils, plants, and animals. Along with carrying out farm projects and managing kitchen operations, Taylor is off in the woods or playing music. Kirsten's passion for growing plants began in her mother's backyard garden. Her botanical curiosity and determined attitude produce vibrant vegetables, luscious fruits, and gorgeous aromatic blooms. 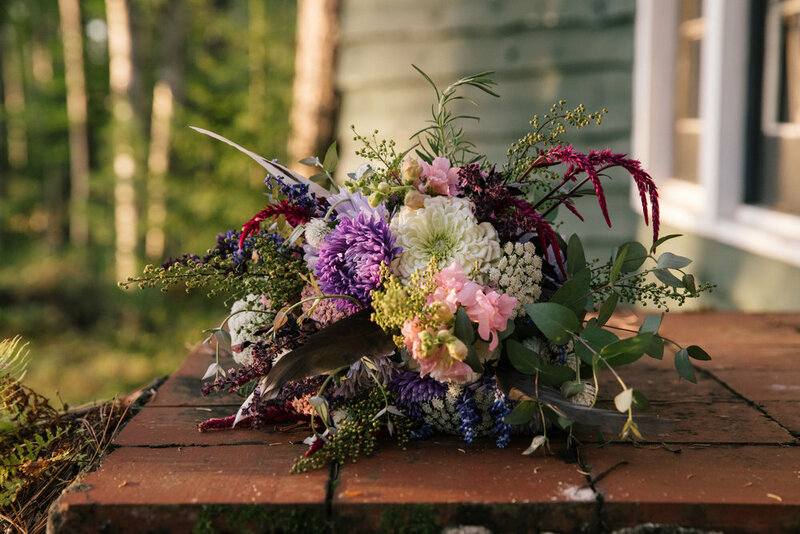 Hyper aware of her surroundings, Kirsten recognizes the beauty in colors and life around the farm and designs floral arrangements that capture these spectacular scenes. With a bounty of plant knowledge, Kirsten orchestrates scheduled plantings of our ingredients so that they are harvested at their peak for each catered event. She also creates floral decorations that reflect the season, location, and color themes decided by our clients. When the plants are at rest, Kirsten tends to her flock of sheep and uses their wool for spinning and weaving. Jay has been feeding himself and others for most of his life, which he aptly says keeps him alive. With 15 years of experience in the food industry, bartending, serving, obtaining a degree from Le Cordon Bleu Culinary School, and cooking, he now has the opportunity expand his love and appreciation for food to the field. "Having the freshest raw ingredients I ever worked with, it is amazing to start with food so fresh and flavorful and lends us to creating beautifully crafted seasonal dishes." After working for world class chefs and establishments in 11 states, Jay is ecstatic to call the Adirondacks his home and to be a part of an ever growing food community and movement. In addition to tirelessly cooking, Jay is out fishing, hiking with his pups, or watching a Bruins game. Jori has her hands in many pots - most of them involving food. Her passion for feeding and fostering her community with the food we grow motivates her daily. Jori has been with us since the beginning - helping behind the scenes to coordinate and ensure all aspects of the event run flawlessly. Utilizing the most of any space she is given, Jori takes the lead when it comes to transportation of our mobile catering inventory. You’ll notice a glimmer in her eye as she rearranges our box truck in a Tetris-style manner. Her gift of implementation, drive and dedication are crucial to our team and overall success. Jori is addicted to sharing with her community. 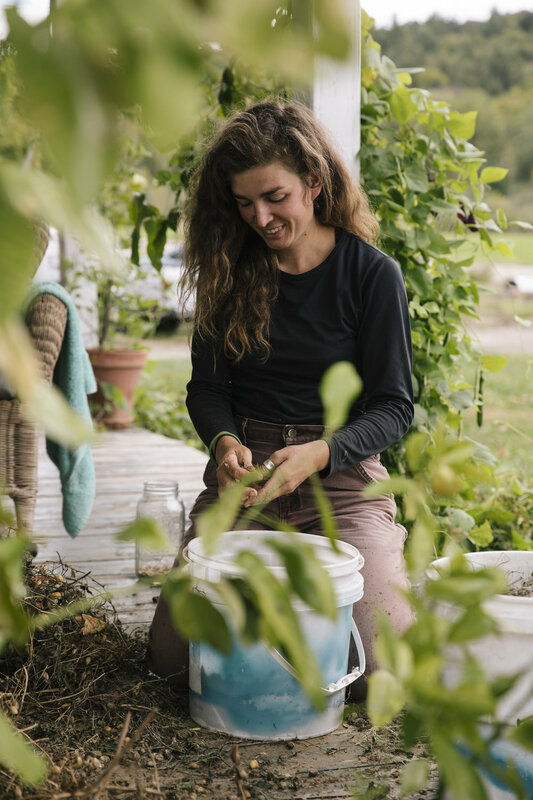 When she is not working with Farmstead, she can be found running the local food hub down the road or even milking cows on Sunday morning at Echo Farm. She frequents auctions of all sorts and uses her unique finds resourcefully to help a particular project at hand. Striving for customer satisfaction, Healey has been working among local restaurants around the region supporting her community for years. Being successful in creating and maintaining ambience through high-stress environments of the restaurant industry has been her top priority. The community developed relationships she has established have allowed her to transition seamlessly into the catering atmosphere exercising her newly sharpened skills of multitasking, time management and efficient customer service. Surrounded by a family that has a deep knowledge of culinary experience, her love for food, its style and scene has developed at an early age. Her excitement for food, its source, preparation, and presentation, are all apparent through her appetite. In her spare time, Healey enjoys romping around the Adirondack mountains with her floppy-eared best-friend, Chloe.